The building blocks of a project start with a Work Breakdown Structure (WBS). The WBS is a hierarchical reflection of all the work in the project in terms of deliverables. In order to produce these deliverables, work must be performed. WBS is a hierarchical and incremental decomposition of the project into phases, deliverables, and work packages. It is a tree structure, which shows a subdivision of effort required to achieve an objective; for example a program, project, and contract. Creating a Work Breakdown Structure is a team effort and is the culmination of multiple inputs and perspectives for the given project. One effective technique is to organize a brainstorming session with the various departments that will be involved with the project. Project teams can use our Gantt chart template to identify major deliverables, sub-deliverables, and specific work packages. Gantt Excel auto calculates WBS for you based on task hierarchy so that you don’t have to do the hard work, you just need to figure out the major deliverables and the sub-deliverables and the tool magically takes care of it for you. The key benefit to Gantt Excel is its ease-of-use translating work breakdown structures into high-level project schedules. 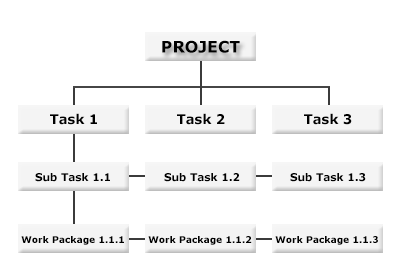 A natural extension of the work breakdown structure is the project schedule. By brainstorming the project scope in a Gantt chart tool, the project manager can easily assign budget and duration estimates.